Well, if you are just looking for the method of bookmarking or saving a facebook post from your news feed, I would like to say that you arrived just in the right place because in this post, we will be going through the method of saving facebook posts from your news feed to be seen later. First of all, head over to the post shared by any of your friend that you would like to save for reading it later. After clicking on save option from the drop down menu, this post has been saved to your facebook profile. Now you can see it whenever you want it in future. As we discussed in above section that how we can save a facebook post to be read later, I hope you understood and had saved posts that you like to read in future, Now the thing is that you want to open it later on, so there is nothing to do so, all you have to do is just need a click on "Saved Posts" button from your facebook news feed. In case you still didn't understand. Log-in to your facebook profile. Scroll to down side a bit. 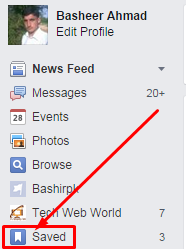 Now look at the left sidebar of your facebook main page, just below the "Edit profile and pages you manage" You will see "Saved" So click on it. In case you saved a post for the first time (just for testing purpose) you will not see this option until you refresh the page so click on the refresh or Reload button of your browser and then go through the left sidebar. 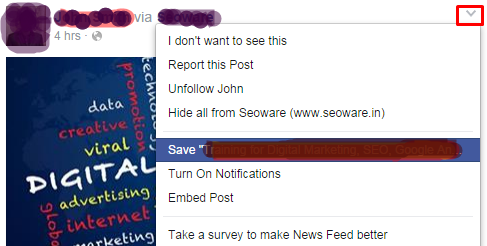 Here now you will be able to see the option "Saved" by clicking on, you will be redirected a pager where you can see all the things you had saved from your facebook news feed like Links, Videos, Places, Music, Movies etc. Please comment in English so we could understand!